Video #BossLady Features Meet the Team! Yay for blog collaborations! Especially when they are as fabulous as this lady! If you haven't checked out The Little Ferraro Kitchen yet, head on over for an absolutely scrumptious drool fest. 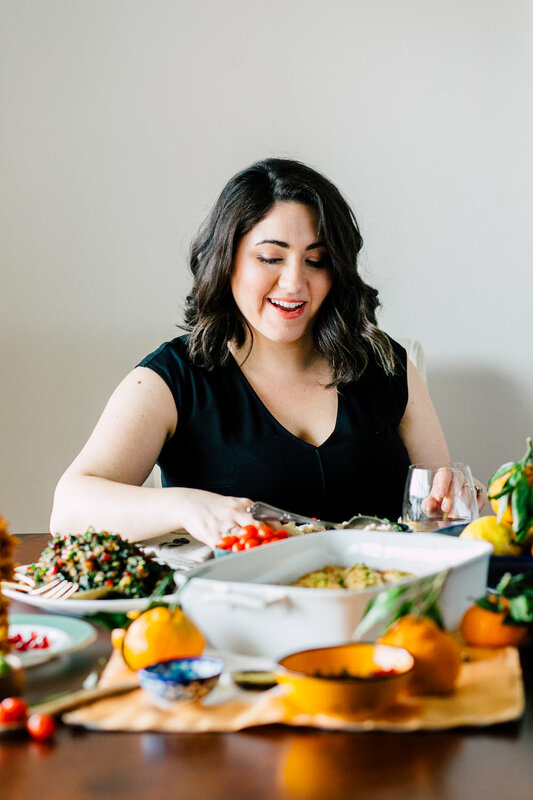 A relatively new captive of our beautiful PNW, Samantha first got in contact about getting dolled up for her head shots with Kathryn Moran Photography, we jumped at the chance of doing a #BossLadyBlogger feature on her. She is full of laughter and her unique background leads to some beautiful recipes just waiting for you to try! Welcome to Bellingham Samantha! Hi everyone! I write, cook, and photograph for the food blog The Little Ferraro Kitchen. I come from a pretty diverse background, growing up Jewish in Brooklyn, NY, then living in Hawaii all throughout my teen years, then on to Southern California for another 10 years and finally settling down in the beautiful pacific Northwest! Because I come from such a diverse upbringing and have lived in so many places, food and culture is what I love most and love to cook and write about My food blog focuses on world cuisine, inspired by my travels, places I lived or my childhood. 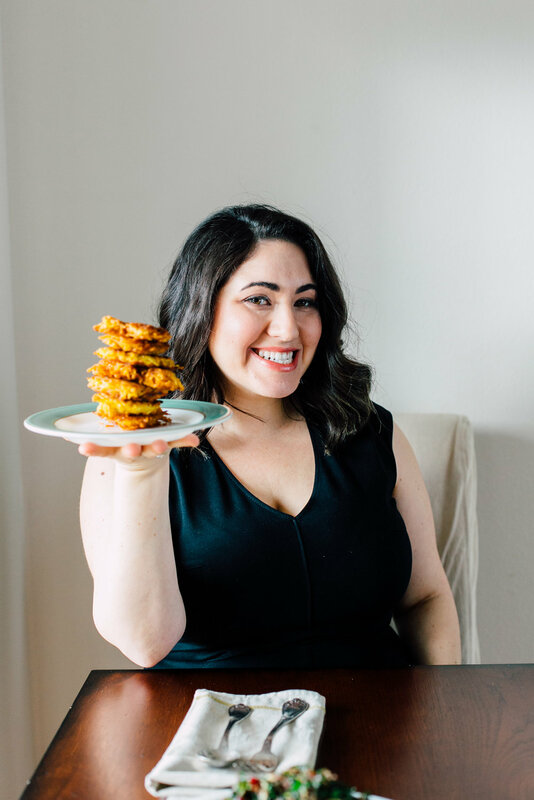 You'll see Jewish and Turkish recipes I grew up on, or fun modern twists to combine cultures, such as Caprese Latkes or Lemon Saffron Matzo Ball Soup! I started the blog in the summer of 2011. I was going through a transition and finishing my degree in Health Education in California. I loved what I was going to school for, but craved a creative outlet, which for me was cooking. As I started cooking and sharing recipes, learning about different cultures and experiencing the world through food became more and more exciting and fascinating and still is. So....I finished my degree but also continued my blog, cooking, sharing recipes and stories and the rest is history! What do you feel is unique about your blog? That's a really good question! I think what's unique about my blog is that I am constantly learning! It's not always about me sharing MY recipes, but I love to learn how your family has made it, or what your traditions are. For example, I posted "pasta Fagioli", which is an Italian bean and pasta soup and I made it with a red broth and then I had a comment saying that her family has always made it with a white base, though called the same thing. I also try and keep recipes and traditions as authentic as possible, even when having fun and "blending" ideas, I want to be respectful of the ingredients, techniques and flavors. What are some big trends you are seeing right now and how can we incorporate them into our everyday lives? Oh, being a food blogger, you always have to be ahead of the trend. You need to be making post-Thanksgiving leftovers in September and baking holiday cookies in October. Which makes it interesting to cook with seasonal items, but I think that is the trend now. Cooking as organic and seasonal as possible, which I just adore. Ever since we moved to Bellingham, I am in constant awe of the amazing local produce, farms and small-business food producers all within an arms reach. It doesn't get better than this. What is a hardship or challenge you have had to overcome and how did you handle that? I always try and keep positive. Moving from Southern California to Bellingham wasn't a huge hardship, but definitely a bit stressful and took some time out of recipe development and blogging. But once we got up here and started touring all the local farmers markets and orchards, I was in absolute foodie heaven! How do you balance being a #bosslady with having a family/life? I think this is a constant struggle, personally because you want to constantly keep your business running and people engaged. There are all the behind the scenes technical aspects that go on with a blog, such as editing photos, managing the site, trouble shooting, email blasts and social media shares. It's a lot and sometimes can get overwhelming, especially for a more creative person like me, that isn't a tech-guru. If I get overwhelmed, I take a break and do something else to let my mind rest. I have also joined a social media management site that helps you schedule posts/shares in advance which is a lifesaver. And....I will enjoy that glass of wine at night, with dinner and a movie at home. Because, it's all about balance. If you could give someone starting their own blog any advice what would it be? My biggest advice is to be authentic and find what motivates and inspires you. It's great to be inspired by other blogs and trends, but being yourself is what really matters. Find your niche and ask for help when you need it. The food blogging community is pretty awesome and are always there with a helping hand. If you're really ready to start, start with a wordpress site and just start blogging! Then gradually add photos and connect with other bloggers.